A South West charity has received £1m to help with its work sending aid to victims of the Asia tsunami disaster. 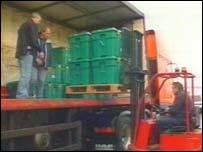 The Cornwall Rotary Club charity Shelterbox has sent 500 survival boxes to Sri Lanka and India. In India, boxes are already being flown to areas most in need by the country's air force. Another 200 boxes are due to leave for the area on Tuesday night. A Devon family who survived the tsunami, the Halls from Braunton, have asked people to give more to help. Each of the boxes being sent to Asia by the Helston Lizard Rotary Club's Shelterbox contains a 10-man tent, sleeping bags, water purification tablets, containers, cooking sets, torch, rope and basic survival items. But Mark Pearson from Cornwall, who has gone to the eastern province of Sri Lanka with the boxes, said the weather was causing huge problems. He said: "Because it's monsoon season, there's so much rain that the ground gets saturated in about 10 minutes and people can't get the tents up. It's quite a difficult situation." Managers at Oxfam shops in Devon and Cornwall say they need more volunteers to cope with the public's generosity since the disaster. The manager at Cornwall's Helston branch, Maxine Wickham, said the public's response was overwhelming, but that 100 extra volunteers were needed in Cornwall alone to deal with donations. She said: "All the shops are absolutely swamped with donations through the door, and the goods given have been absolutely incredible." A Braunton family who survived the tsunami are appealing for people to give generously to the relief operation. Phil and Jan Hall were staying with their daughter in Narigama in south west Sri Lanka when the Tsunami struck. They managed to get to safety and found sanctuary with local people on a hilltop. The couple said the people there desperately needed help. Phil Hall said: "If they can't fish, they can't feed themselves and they haven't got the ability to earn money so their standard of living drops dramatically. "I think that people from around the world go to see these places and we take something from it, so I think we should give something back."